I do what I call, “Facebook drive-bys” these days. I check my Finishers page and that’s really about it. But when I do hop on, sometimes I catch something very interesting in the newsfeed at the top. Sometimes, it’s one of those “sponsored” posts that makes no sense for me. Sure, I hopped on Facebook to learn more about Colgate toothpaste? Not very well played Colgate. That’s when I discovered a post from Brad Pilon, the author of Eat Stop Eat. If you don’t follow Brad (on facebook or his blog), I suggest you do. He’s got a great simplistic approach to nutrition. I’ve worked with men with ~6% body fat as determined by multiple DEXAs. These people did not have a visible 6 pack. I’ve also worked with men who can have visible abs at ~12% due to a higher degree of ab development and overall muscularity. The difference was the muscle mass underneath the fat. 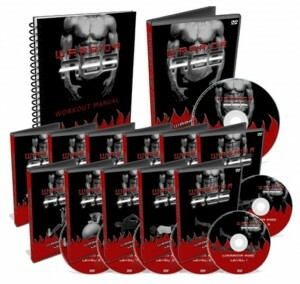 The goal of reducing body fat is to show the muscle that exists underneath the fat. If the muscle is not there, if it is not developed, it will not show through, no matter how little body fat you have. Anyone who has worked in an anatomy lab will know that in untrained people (most of the people you dissect) the abs are basically just a sheet, as are muscles like the lats and even sometimes the pectorals. ‘Seeing muscle’ is a function of enough development that they look separated from the other muscles – they get thicker in the middle, in the belly of the muscle – this is what lets them standout. This is the truth… You may be wasting your time using worthless ineffective exercises… And worst of all you could even get injured in the process. The muscles that everyone knows about and desires to be seen with are the rectus abdominus, those flat rippled muscles that dawn every beach body on TV. 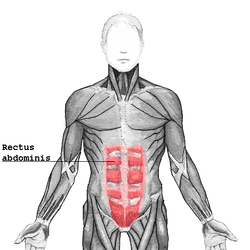 The problem with traditional ab workouts isn’t that they don’t affect the rectus abdominus because they in fact do. When I first started training, I used to do crunches at the end of my workout. I did a variety of regular crunches, diagonal crunches, and even Captain Crunches. No? Not funny? Oh c’mon. It’s 6 in the morning. Whatever. The problem wasn’t that the muscles weren’t being worked, the problem was that I was working the WRONG muscles. There is a group of muscles that surround the abdomen much like a corset whose sole responsibility is to stabilize the spine and core during phases of movement. The reason why these muscles are so important is because they are essentially the ones the give your stomach that flat appearance. There’s one woman who, even though doing 1,000 crunches daily, and having a relatively low body fat, STILL had a case of the dreaded paunch belly. We all know someone who has a relatively low body fat percentage but seems to still have that little beer gut even if they don’t drink beer or are constantly spending hours in the gym. Why is this? Well, one of the reasons is because they have the dysfunction of those deep abdominal muscles not doing their job right. So how do we target these mystical muscles that rapidly flatten and tone our midsection? We turn towards FUNCTIONAL MOVEMENTS. One of the best ways to target these deep core muscles and quickly flatten our midsection is to use exercises that cause the core to fire as a stabilizer rather than a mover. Thankfully, this is easier done than said. One simple exercise that you can do is a elbow plank on a swiss ball. You are instantly going to feel all of the stabilizers of the inner unit work hard to support your body in the plank and keep the spine protected. Remember to keep your core tight and your lungs filled with air to keep you extra safe and give you more bang for your buck. Here’s how to make that harder – extend your arms as if you’re performing a pushup on the ball. This is called the “Superman Stability Ball Plank”, also known as “Awesome Sauce”. There are of course even more effective exercises that will help you to fire these deep abdominal muscles and get you one step closer to your washboard stomach. Many of them modeled after the best gymnastic and functional training routines for developing not only awesome abs, but an injury proof, super strong core. And when you have a stronger core, your performance in ALL lifts improve. Remember, your body fat certainly needs to be lower to see your abs, but that’s just part of the puzzle.